The Advanced Software Framework (ASF) is a collection of embedded software for Atmel flash microcontrollers. It simplifies the usage of microcontrollers, providing an abstraction to the hardware and middleware. It is designed to be used for evaluation, prototyping, design and production phases. ASF is integrated into Atmel Studio IDE. This tutorial shows you how to use the ASF to create an Audio Sine Tone application running on the SAM V71 Xplained Ultra Evaluation Kit. Just build the solution project and download it to the SAM V71 Xplained Ultra Evaluation Kit to observe the expected behavior. Create an Atmel Studio project from scratch for SAM V71 microcontroller. Use the ASF Wizard to select the ASF modules (driver(s)/component(s)/service(s)) to be used by the application. Setup the board, clock, and serial interface configuration. Add code to configure the SSC(I2S) and XDMAC(DMA) peripherals and the WM8904 audio codec. Add code to initialize the application and generate the sine tone. Demonstrate the use of ASF modules (services and drivers) to control SAM V71 peripherals (SSC, TWI, USART, Timers etc.). The Xplained Ultra series evaluation kits include an onboard Embedded Debugger (EDBG), and no external tools are necessary to program or debug the ATSAMV71Q21. 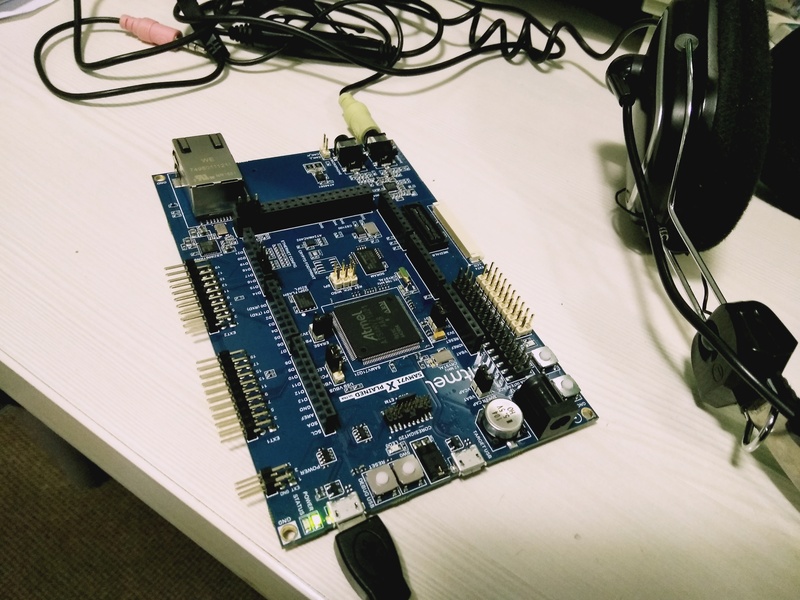 The EDBG connects to the host PC through the USB Micro-B connector on the SAM V71 Xplained Ultra Evaluation Kit for programming/debugging. Note that you don't need to separately install the IDE, ARM GCC Compiler, and ASF. Installing Atmel Studio will install the IDE, supported ARM GCC compiler and ASF. This lab enables the SAM V71 Xplained Ultra Evaluation Kit to act as an audio speaker by playing the sine tone data (sampling rate: 48kHz, 16-bit data), stored in a lookup table in internal memory. This is done by adding SSC, XDMAC, and codec driver libraries to the project. SSC (Synchronous Serial Controller) is a serial synchronous communication module available on Microchip’s 32-bit Cortex®-M3, Cortex-M4 and Cortex-M7 series of microcontrollers. SSC supports multiple synchronous communication protocols generally used in audio and telecom applications such as I2S (Inter-IC Sound), Short Frame Sync, Long Frame Sync, etc. In this application, SSC is used to interface with audio codec WM8904 over I2S protocol. XDMAC (Extensible DMA Controller) performs peripheral data transfer and memory move operations over one or two bus ports through the unidirectional communication channel. Configure Clock and Board: Functions sysclk_init and board_init initialize SAM system clock and board configurations. Configure Console: The function configure_console initializes the debug console interface (USART). Configure codec: The function configure_codec configures the codec WM8904 in master or slave mode. Configure SSC: The function configure_ssc configures the SSC peripheral for transmission of audio data in I2S mode acting as a master or slave. Configure XDMAC: The function configure_xdma sets up the transfer through XDMAC peripheral by configuring XDMAC peripheral in linked list mode. Enable Reference Clock: The PMC functions pmc_pck_set_prescaler, pmc_pck_set_source and pmc_enable_pck enable the reference clock to the codec WM8904. 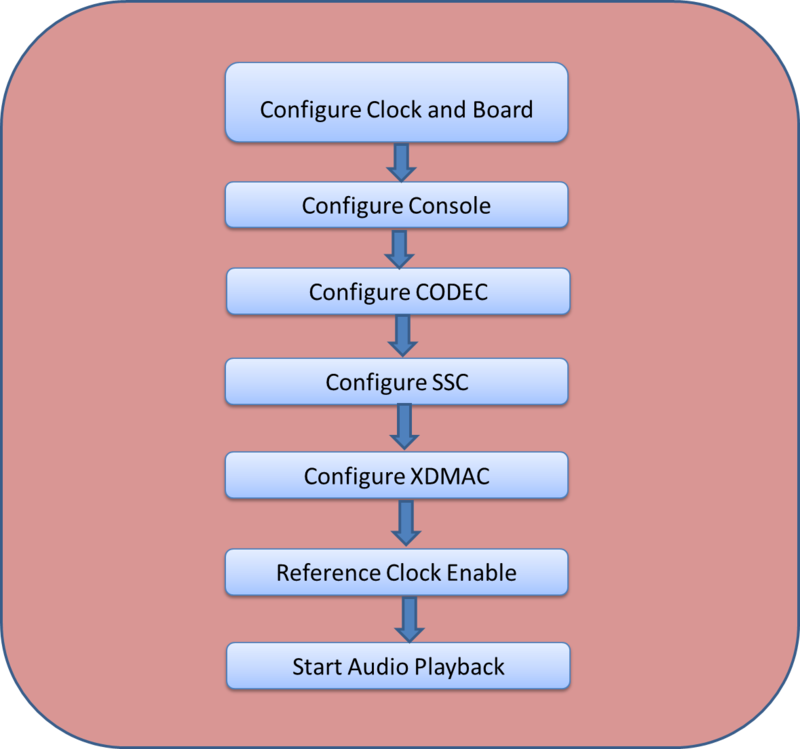 Start Audio playback: The functions ssc_enable_tx and xdmac_channel_enable start the audio tone playback. audio_sine_tone_lab contains the complete lab solution (audio_sine_tone_lab.atsln and related files under sub folder audio_sine_tone_lab) and source files (in the dev_files folder) to create the lab from scratch. dev_files contains application source files and other support files (if any) required to perform the lab from scratch (see Procedure section below). audio_sine_tone_lab.atsln is the completed lab solution project. It can be directly built and downloaded on the hardware to observe expected behavior.